my6sense, the company focused on digital intuition and hyperpersonalization of streams, including RSS and social streams such as Facebook and Twitter, has added a new partner in Ecademy, the UK-based social business network. 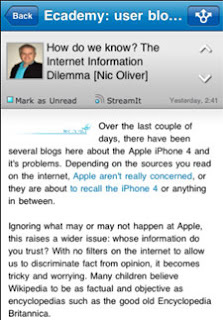 Today, leveraging the company's API for content relevance and filtering, the two companies introduced a co-branded application in Apple's iTunes store that prompts Ecademy users to connect the network as an addition stream, bringing the individual personalization and relevancy filters my6sense is known for to a new community - much like they did when first tackling Twitter and Facebook after starting with RSS feeds at its core. The co-branded application behaves and looks much like the standard my6sense application, highlighting the feeds you pull into the program, and sorting them in order of assumed priority based on your own implicit activity. Over time, thanks to what articles you read or skip, among many other factors, the program continues to modify its algorithms to match you, bringing the assumed "most important" and most relevant content to the top - no matter their source. 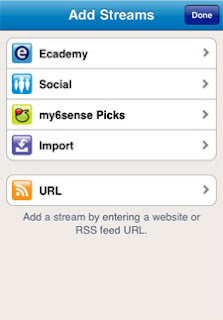 The Ecademy my6sense application, available here on the iTunes store for free, adds blogs from other Ecademy users to the mix, giving them an equal shot at your attention to streams from any other source. In my testing of the new product, my6sense recognized my personalized profile from their database, and once linked to Ecademy, it was clear that the same process which has cleaned up my feed reading on the mobile phone works on this new source. 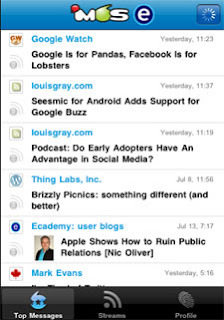 Intriguing blog posts on technology companies I follow closely, like Google, Apple and social networks, rose to the top, and those that were less targeted were well below the fold. The co-branded application is a good test case for my6sense's promise of filtering any streams on the Web that can be sorted by relevancy based on user behavior. Ecademy's broad base of users with wildly varying interests will probably find the product a welcome introduction that brings relevant posts their way, while reducing the visibility of the rest. Disclosures: my6sense is a client of Paladin Advisors Group, where I am managing director of new media. 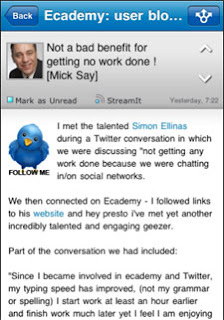 I have done previous speaking work and other paid activity with Ecademy, including a social media retreat in February. I did not gain early access to this product, nor did representatives from either company see copy prior to posting.